In past blogs I've talked about the need for non-school tutor/mentor programs to be included in national strategies for raising kids. Dr. Halpern states the value of afterschool programs much better than I can, and calls for a "de enlistment" from strategies that tie funding of non-school programs to narrow test score result measures. Of course, until we find the money this is not likely to happen. Until we change the thinking of a lot of donors, we won't change the flow of dollars. That's where Zukerman's blog comes in. Those who are tutors, mentors, or who lead these programs have many great stories to tell. At http://www.cabriniconnections.net you can read a message posted by one of the seniors in the Cabrini Connections program. In the LINKS library of the Tutor/Mentor Web Library many other tutor/mentor programs tell their stories. We're all trying convince volunteers and donors to support us. However, none of us has huge advertising budgets, and each of us singing our own song at different times each day or each year, just makes a loud noise. It's not an orchestra. It's not music. We need to be saying the same things, and aggregating our messages, at key times when what we are talking about can generate a greater response for all of us. If we learn to adopt some of the strategies Zukerman is describing, and if we find ways to aggregate our blogs, in web libraries like this part of the Tutor/Mentor web library , our blogs do become an orchestra and a collection of stories, and maybe more people will understand what Halpern is writing about and what most of us know from our own experience in leading non-school tutor/mentor programs. Visit the Tutor/Mentor Leadership Conference page at http://www.tutormentorconference.org and read how you can learn more about these strategies, or how you can take a role in teaching others how to blog, or how to build and sustain a volunteer-based tutor/mentor program. If you know any donors, or people who want to end poverty through education to careers, you can invite them, too. Until they are in the orchestra looking at the same music, we'll still be struggling to find a place to play. Over the past couple of weeks I’ve written about the shootings in Englewood, and expressed my concern that nothing will happen because there is no plan for engaging people from beyond poverty in this discussion in a process that creates ownership, understanding of the issues, and a dramatic increase the resources needed to build and sustain comprehensive tutor/mentor programs in poverty neighborhoods. Yesterday, 3/21, I participated in an audio conference titled “Integrating Mentoring and After-School”, which focused on the need for mentoring programs in more places (like Englewood) and the potential for these programs being hosted in traditional after-school programs, such as Boys & Girls Clubs, YMCA’s, schools, etc. I encourage you to read the Policy Commentary at http://www.forumfyi.org/files/ostpc11.pdf. In a few days you should be able to read a transcript of the actual audio conference. Today, 3/22, I attended an event titled Non profit Leadership Challenges and Opportunities, which was hosted by the Donors Forum of Chicago http://www.donorsforum.org/calendar/npcalendar.html#np_leadership. Representatives from Compass Point, presented findings from a web survey that was distributed in eight cities over the past year. It’s titled “Daring to Lead, 2006” and you can download the full report at www.compasspoint.org. The Daring to Lead presentation highlighted three surprising findings: a) 30% of executives leave their jobs involuntarily (either fired or forced out); b) Executive directors plan to leave their jobs but will stay active in the nonprofit sector; and c) A key driver of executive burnout is frustration with funders. While the focus of the Donor’s Forum meeting was on succession planning, which is essential to leadership stability and organizational growth, the research constantly pointed to a lack of ACCESS TO CAPITAL as the primary challenge facing small and mid size non profits. Their was a rousing cheer when the need for funding non-restricted, long-term general operations funding was raised as a pivotal issue. I agree. You cannot keep good leaders, or pay them well, or offer retirement, if you don’t have enough money to pay the rent on a regular basis. If you deal with this problem every day for 12 years, as I have, it tends to be a bit stressful. How do these issues connect? If we want more to reduce the violence in neighborhoods like Englewood, we must provide better education and career opportunities. To do this we must increase the range of non-school programs that help kids succeed in school, stay safe in non-school hours, and move successfully to jobs and careers. The only time when work place adults are consistently available to be involved in long-term mentoring is after 5pm, when most after-school programs are not open. Finally, it takes years to build good tutor/mentor programs and it takes a dozen years just to help a youth go from first grade through high school. It takes another 6-8 years before that youth is anchored on a career path. We can never support this process on a consistent basis in many locations if we cannot attract and keep key leaders for existing programs, let alone attract thousands more for the additional programs needed in Chicago and around the country. We cannot do this without changing the funding paradigm. There must have been over 500 people at the Donors Forum event. I don’t know how many were in the audio conference on Tuesday. However, most will never be in the same room, or the same discussion, at the same time again, because there was no strategy in evidence that gave participants and opportunity to connect with each other, and the presenters, in a facilitated, and open, on-going dialogs. That’s why we created the Tutor/Mentor Connection. That’s why I invite anyone interested in tutoring/mentoring as a strategy for civic engagement and for increasing the understanding of poverty, to participate in the May and November Tutor/Mentor Leadership Conferences held in Chicago and on the Internet. These are a meeting place for people to come together to present, reinforce, advocate and discuss information such as was presented over the last two days, in the context of the urgency that is reinforced by the media coverage of events like the shootings in Englewood. Over the past two year’s we’ve also begun to develop a web conferencing process, so that people from distant locations can connect with people in Chicago, during the May and November conference periods, and so that people can stay connected on an on-going basis. As others host video and audio conferences, or face to face meetings such as today's event, my hope is that they will build web strategies that link the participants to each other, and to affinity groups such as the Tutor/Mentor Connection. Our goal is to turn discussions into meetings, and meetings into a process of identifying tipping points, or ways to collaborate in activities, like leadership development, funding, volunteer recruitment, which effect all tutor/mentor programs in the country, not just our program in the Cabrini Green neighborhood of Chicago. If you read back through the blogs I’ve posted in the past year, you’ll see that there have been many forums where information of importance was presented to a gathering of interested people. I invite all of those who are creating and presenting research on poverty, workforce development, tutoring/mentoring, violence prevention, youth development, service learning, etc. to use the T/MC conferences and internet space as additional times and places where you can present your information, help more people understand it, and contribute to a long-term process that leads to the development of more and better programs that keep kids safe, successful in school and moving toward jobs and careers. The reason nothing will change in Englewood is that too many people are marching and calling for truces and an end to the violence, and in front of the cameras, getting face time while the cameras are focused on the tragedy in Englewood. There's nothing wrong with that, except it just creates a flash of anger. Nothing is sustained. There's no plan. Too few people are in deep thought innovating ways to build and sustain a long-term movement. Too few people are creating new ways to build involvement, ownership and public support from all parts of society, especially those who only read about poverty and tragedies like this in the paper. It will take a comprehensive vision, sustained over many years to change the conditions that make neighborhoods like Englewood feeding grounds for gangs, drugs and random violence. The tragedy is, too few people follow up after the rage had died down to sustain and expand a movement long enough to do any good. Change that and we change what’s happening in Englewood and in hundreds of inner city neighborhoods throughout the country where the same thing is happening. On page 1 of the March 13, 2006 Chicago Sun Times the feature headline is WHEN ARE THEY GOING TO STOP KILLING OUR KIDS? The headline in the Chicago Tribune is Another Stray bullet shatters Englewood. On October 15, 1992 the front page of the Chicago Sun Times feature headline was “THE KILING GROUND: 7-Year-Old’s Death at Cabrini Requires Action. In the 14 years between these two headlines there have been dozens of smaller stories about violence, and hundreds of unreported stories. In addition there have been feature stories about poverty, gangs, poorly performing schools, ex-offenders being released into poverty neighborhoods, etc. You can find copies of many of these stories in the files of the Tutor/Mentor Connection’s offices at 800 W. Huron in Chicago. What I cannot find, are web sites that link these stories and show how they are interrelated. What I cannot find are stories that talk about comprehensive efforts to build community support systems in neighborhoods like Englewood that provide youth with a variety of learning and enrichment opportunities and surround them with a network of adults who are committed to helping kids move through school safely and into jobs and careers. Stopping the killing in Englewood is not just about getting guns off the street. Ending the war in our inner cities is no easier than ending the war on terrorism. This is a complex social problem that will take the involvement of many people over many years. The solutions must enlist business as self-interested partners, along with universities, faith networks, media, hospitals and the entire orchestra of civic and social organizations. When Dantrell Davis was killed in 1992, most of us did not even know that the Internet existed. Things have changed. People from around the world are connecting with each other via the Internet. Complex ideas are being discussed by many people in many different places. I read the article. I encourage you to read it to. It shows the importance of knowledge and information, which is the primary currency of the Tutor/Mentor Connection. 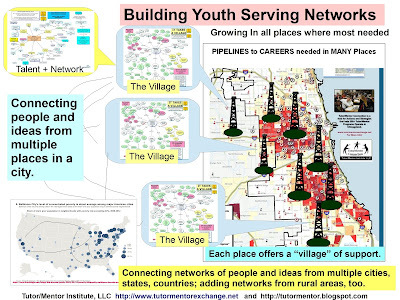 Other than maintaining a Program Locator database of Chicago area tutor/mentor programs, we don’t create new knowledge. What we do is collect, aggregate and organize it on our various web sites. The reason I support volunteer based tutor/mentor programs like www.cabriniconnections.org is not because they solve all of the problems facing inner city youth, but because they engage more people personally in the lives of these kids and create a bridge linking poor neighborhoods with more affluent communities, with business, with universities and with others who must be more passionately and strategically involved, for many years, if there is to be a paradigm shift in what is happening in high poverty neighborhoods around Chicago and in the rest of the world. When a person gets Cancer, he becomes a big supporter of Cancer Research. When a father loses a child to a school yard shooting, he becomes a gun control advocate. What do we need to do to create this type of personal involvement and commitment before a tragedy occurs? Getting people involved in volunteer-based organizations that create a weekly, monthly and long-term connection with poverty is a place to start. Unfortunately, too few of these organizations exist. Search the Program Locator at http://www.tutormentorprogramlocator.net/Prgloc.aspx for the 60636, 60621 and 60620 zip codes (the Englewood Neighborhood). 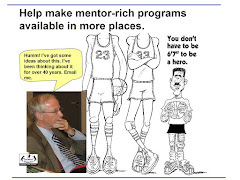 You’ll find very few comprehensive tutor/mentor programs. Ask the leaders of any tutor/mentor program in Chicago, and you’ll also find that there is too little funding to help tutor/mentor programs grow and sustain volunteer involvement. Ask the Tutor/Mentor Connection and we’ll tell you how difficult it is to find dollars to support the Program Locator and other services of the T/MC. I don’t expect the news media to change the way they sensationalize bad news. It sells papers and they are in business to make a profit. What I do hope to do is engage the media and the business communities in innovative thinking of how they can use their resources, their leadership and their visibility to draw daily attention to the issues, like advertisers draw daily attention to their products and services. We don’t need a front page headline every 14 years. We need this emphasis from someone in business, media, politics, religion, etc. every day. We need them to point to web sites like http://www.tutormentorexchange.net so that people can find where to get involved, why to get involved, and how to be smarter when they do get involved. The tragedy of Englewood is that too few people will read this and respond, which means the tragedy will repeat over and over again. Today, March 4, 2006, the front page story of the Chicago Tribune shows a picture of a 14 year old honor student who was killed on Friday morning when a stray bullet fired from an assault-type rifle went through a window of her house and struck her in the head. The paper gave the address as the 6700 block of South Honore Street. I looked up the zip code. It is 60636. If you look at this zip code map http://www.chicagoreader.com/cgi-bin/sf/zipmap.cgi?hfs you can see where the 60636 zip code is in the South part of Chicago. If you look at this map showing poverty in Chicago http://webpages.charter.net/jcory17/geotech/pic_lib/census2k/maps/image2.htm you'll see that this area has 20-40% concentrations of poverty. The youth who was shot was an "honor student" who was trying to escape this violence. However, if you search the program locator database at http://www.tutormentorexchange.net/Partner/CC/Program_Locator/prgloc.asp for the 60636 zip code, looking for a mixture of tutoring/mentoring, like you see at http://www.cabriniconnections.net, you'll find no listings. This means that if there are any programs in this area working to keep kids in school and out of gangs and violence, they are operating in isolation, and struggling on their own to find resources to do this work. Or, there are no programs. In either case, the tragedy of a 14 year old girl should be enough to get lots of people angry enough to want to do something. I don't see anything in the Tribune that calls on businesses, foundations, churches and others to help start non-school tutor/mentor programs in this area, or that points to others parts of the city with similar problems, where programs do operate, but struggle for donations to support their work. Maybe we'll see this in editorials in the coming week. However, if you want to stop this violence, you can become a volunteer, donor, or a leaders. You can use the Program Locator to decide what neighborhood and what programs you want to help. You can support the Tutor/Mentor Leadership Conference, http://www.tutormentorconference.bigstep.com, so programs can come together and learn from each other. You can even support the T/MC and our efforts to help new programs start in areas like Englewood, by providing knowledge people can use to build new programs, and tools like the Program Locator, and Map Gallery, so people can find programs already operating in neighborhoods with too much poverty, and too many poorly performing schools. Finally, you can become a link between this message and this blog and your friends, family, co-workers, faith community, college, alumni network and others who need to be involved, but have not yet been introduced. We can try to prevent future tragedies like this by building programs that keep kids coming to school, keep kids safe in non-school hours, and keep kids focused on legal jobs and careers. Or you can just ignore the problem and wait until the next time this story is on the front page of our major papers.